Beat the heat with this awesome 15-foot inflatable water slide that’s guaranteed to get you soaked! Great fun for ages 2-12. The 15-foot Backyard Splash Slide will keep tots to ‘tweens cool in the heat! This slide from Sun Country Amusements features a front climb and a landing pad. Our new wet/dry combo is like a waterpark in your yard! 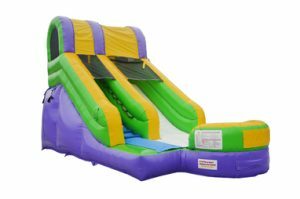 Newly designed non-slip bouncer floor offers safe jumping fun along with a waterslide and a refreshing mist while bouncing. This party rental can spice up any event! 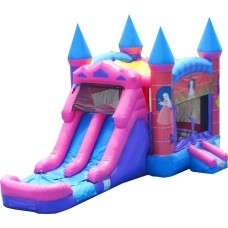 The Pink Princess Double Lane Bounce House Slide Water Combo is in the shape of a princess’s castle, with spires on the corner pillars. The inflatable features vibrant pink and purple colors and a colorful graphic over the entrance. The three-foot ramp makes for easy entrance into the bounce house. 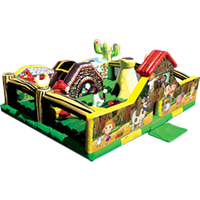 The large bounce area and the attached slides will provide hours of active fun at your next party or event. Ideal for birthday parties and events with princess and fairy tale themes. Have cool fun in the underwater world of our newest inflatable water combo! This unit offers a dry bounce area ending in a water slide with a pool. Refreshing fun for ages 2-10. (Slide has an inflated landing area, not shown). 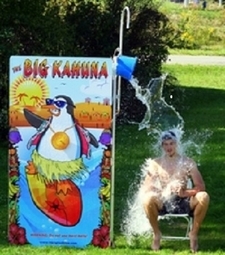 The Big Kahuna water slide is perfect for little beachcombers and surfers at your festival or party. 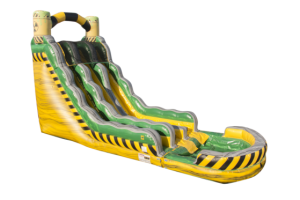 A great way to cool off, this exciting ride allows participants to climb 19 feet to a “No-Jump” top, which forces riders to slide down properly, keeping them secure. A midway hump will have riders saying “Cowabunga!” into the safety-ended pool at the bottom of this impressive slide. 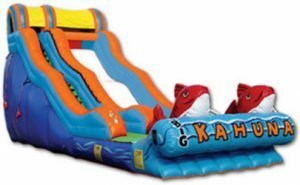 A beachy, blue and orange ocean theme completes the Big Kahuna look, with a pair of red fish waiting at the bottom of this refreshing inflatable water slide. Race down this slide before the oozing slime gets you! A cool new addition to our amazing summer fun. This slide has a pool at the bottom for a splash landing. Call our party rental company in Savannah to reserve your fun! Say aloha and zip down this superfast slide into a refreshing pool. Any age can enjoy this tropically themed slide. A perfect addition to any summer event. 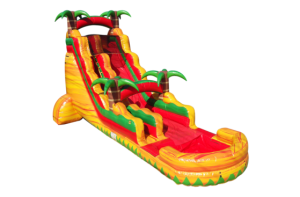 Sun Country Amusements can pair this tropical slide with a range of drinks and concessions. 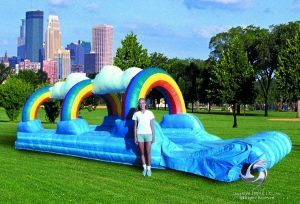 Add even more fun to your adventure with the Slip ‘n Slide attachment, creating a 57-foot long ride. 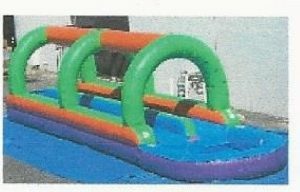 Extend the splash, and be sure to call us to see how we can make this inflatable water slide even more fun! 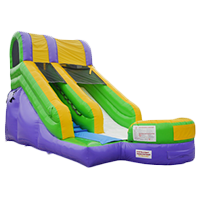 A dual, double-drop slide with 26 feet of fast fun that is great for all ages. Ride down the slide over two bumps before splashing into the pool. 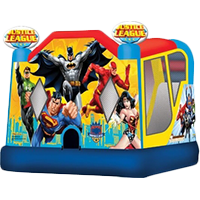 Race your friends and create fun with this affordable party inflatable. 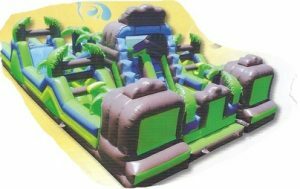 Add water to this huge tropical obstacle course and have a backyard waterpark. Your friends and loved ones can splash their way through, creating a fun adventure for all ages. Surf’s up! Get a running start, dive, and slide along a 34-foot wave for the coolest play above the ocean. A rainshower from the top keeps all your guests cool on our HOT summer days. 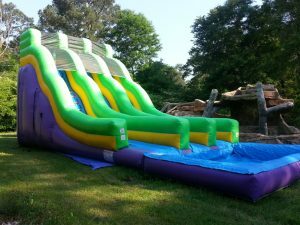 Beat the Georgia heat with our fun inflatables! $50 discount if rented with a waterslide. Surf’s up! Get a running start, dive and slide along a 34-foot wave to meet your best friend in his pineapple at the bottom of the sea. Are you ready? Reserve your inflatable with us today! Get a running start, dive and slide along 34 feet of rainbows. The rain clouds actually rain on you! This inflatable slide provides fun in addition to relief from our hot summer days. The perfect surf ‘n slide for the younger crowd. It sits a little lower to accommodate smaller children and toddlers, but can still provide some serious excitement. Call Sun Country today to find the best age-appropriate party rentals for your event! Double the fun with the two-lane surf ‘n slide. 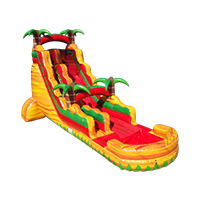 A perfect add-on to the Double Drop Slide, you can extend the fun and competition in a very refreshing manner. For some real refreshing fun, try the Dunk Tank! A great moneymaker for fundraisers, or super-cool fun at any function. Tank has a clear front to view dunkee while underwater. Sell tickets to allow everyone a shot at dunking you this summer, or find another volunteer for the fun! Beware of the bucket! Works like a dunk tank, but safer for younger children, wheelchair bound, seniors, and more. Have questions or concerns for your inflatable rentals? Call Sun Country Amusements in Georgia to find the best fit for your event. This is the ultimate in walk-on-water fun. 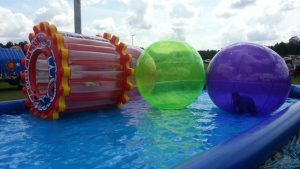 Like a hamster in a ball, you, too can run across the pond or roll your way across in the water-wheel of fun! Kids can have a paddlin’ good time in their own boat. This 20′ x 40′ pond is perfect for cool fun in your backyard or can be a great fundraiser idea for schools, corporate events, community festivals, and church events. 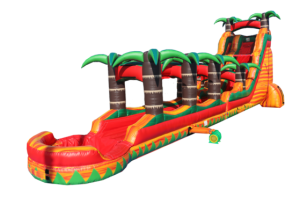 Bring the fun to you with this inflatable rental from Sun Country! Ready to get started? Contact us now, and be sure to preview our safety rules before making a splash with your next party!